Monika Halan is a familiar face on television, giving tips on personal finance. Recently at a cafe in Auroville, she bumped into a man who told her she was the reason he was there, living his dream life. An Army officer, he had called her a few years ago to tell her he wanted to take early retirement, and she had told him his money was “enough to go free”. She gave him investment tips, too. 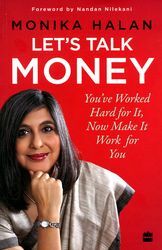 In her new book, Let's Talk Money: You've Worked Hard for It, Now Make It Work for You, Halan shares what she has told the former Army officer and others like him. But she cautions that her book is not going to make anyone rich overnight, and has nothing exclusive in it. True, on both counts. Nowhere does she use the words 'get rich'; the carefully chosen words are “empowerment and financial freedom”. And, though her “mantras” are not novel, Halan does give them a personal perspective, making them seem like a little tip or trick. For instance, consider her take on budgeting—she says it is boring because it is repetitive, writing down daily what all you spent on, most often the same things, day after day, year after year. Cash flow system is simpler, and possibly wiser, she commends. She suggests having three different bank accounts, one each for income, expenditure and investment, and being disciplined about moving money from one to the other. Don't wait for the right time to start saving, or to save when you have the money, she says. Start saving with whatever you have, even with just a few thousand rupees. The second thing is tracking your spending. Choose between need and greed. Resist the urge to spend unnecessarily—do you need that watch, dress and perfume? According to her, one's portfolio gives away whether there has been need in investing or greed in investing. Those who invested in emu farming or Hoffland Finance or mutli-level marketing (MLM) schemes clearly hoped to get rich overnight. MLMs apart, there are high-risk products like initial public offerings, too. She also deals at length with the latest entrant in the high-risk category—cryptocurrency. Clearly, there is wisdom in following the simple tips she hands out. For she often bumps into people who credit her simple advice with having made them live their dreams or kept them away from bad decisions. Written in a simple, direct style, with stories of people around her, this is at once a primer and a refresher on personal finance.